Speed’s Auto Auction is the go-to auto auction service in Portland. We want to hear from you. Please fill out the form and leave us a review. Thanks! 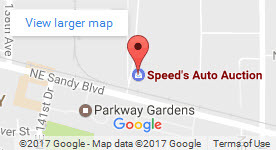 I use Speeds Auto Auction for many of my cars. I like them. © 2019 Speed's Towing Auction. All Rights Reserved.